I came to see the Penguins play in the Stanley Cup playoffs and catch a Pirates game, but one colossal sandwich showed me this millennial mecca has much to offer. We sat down with the lunchtime crowd on the bar side of Primanti Bros. restaurant on 18th Street in the Strip district of Pittsburgh. Just across from us, businessmen stripped down to their crisp shirts with monochromatic ties sat down among tourists in t-shirts, shorts, and flip-flops. The hand-painted menu mounted on the brick wall and the worn, wooden floors gave it a Depression-era feel, a time when the truckers and freight handlers working here made it a popular spot (but now the city boasts 17 locations, and Pennsylvania, Florida, Indiana, Maryland, Michigan, Ohio, and West Virginia also enjoy the deli). 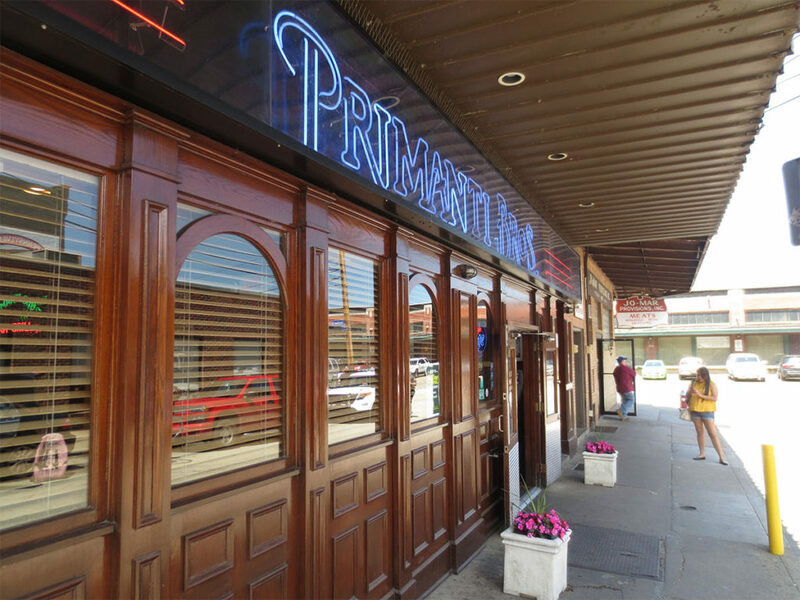 Street front of the original Primanti Bros. Restaurant on 18th Street. Established in 1933 (photo credit: Federico Ghelli). As I continued to gaze at the incoming diners, the waiter placed the towering HBK sandwich resting on a simple sheet of waxed paper in front of me. Staring at that huge stack of meat and bread, I imagined I resembled Pittsburgh native Andy Warhol’s 1986 Self-Portrait, with columns of hair radiating from my head. 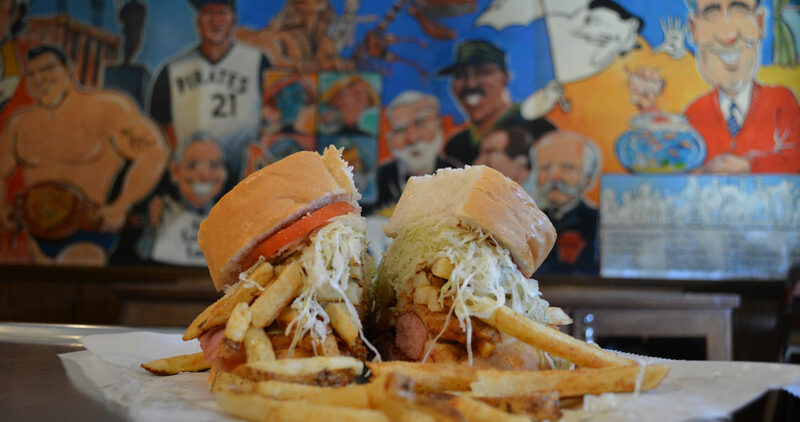 Between two, thick slices of Italian bread, this exquisitely crafted combination of fried ham, kielbasa, and bacon topped with riotous layers of fries, cole slaw, and tomato served as the perfect symbol of the city itself — a culinary invention with a sports reference, two things that earn a lot of attention in Pittsburgh. After one bite, I knew two things. First, I would have no trouble finishing this monster of a belly bomb. And, two, this was the best sandwich I had ever experienced in any city. My friends and I came to the Steel City for the sports. 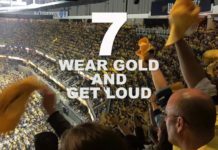 We intended to catch a Pirates game and then watch the Penguins in the Stanley Cup play-offs on the following night. But we wanted to stay for the food. And we soon learned that even though this sports-obsessed town is enjoying some notable victories, it’s the food that has helped it reclaim its reputation for innovation, attracting a new, young, smart vibe, and discarding its frumpy Rust Belt reputation. In fact, the place (and a stadium) known for a condiment and a town with the notable distinction of being the birthplace of the Big Mac is having a food moment. Zagat just listed Pittsburgh as the top food city in the United States. That food fame has helped reignite the city’s reputation for innovation and attracts a lot of young people who appreciate the food, the city’s entrepreneurial spirit, and the cheaper-than-New York prices. “The food scene in Pittsburgh is actually responsible for our landing some best-in-the-world types of people,” says Andrew Moore, the dean of the School of Computer Science at Carnegie Mellon and a founder of Google’s first office in the city in a New York Times story about the city’s youth-driven food boom. 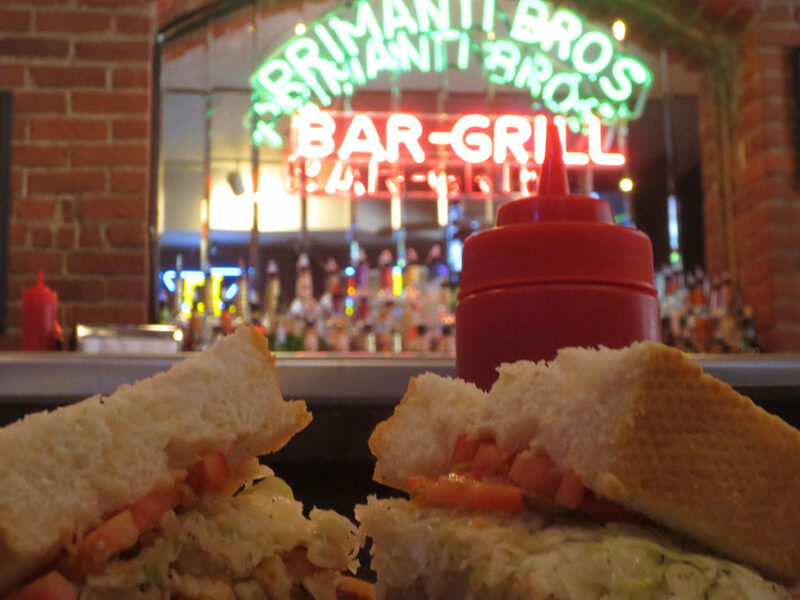 Barside with an HBK sandwich at Primanti’s (photo credit: Federico Ghelli). The real HBK (not the sandwich) was the brainchild of Pens general manager Jim Rutherford as a tactic to counter the offense heavy Tampa Bay Lightning. He designated Carl Hegelin, Nick Bonino, and Phil Kessel to form the Pens’ third defensive line. With Bonino playing between Hegelin and Kessel, this trio gave the Pens the depth needed to keep the Lightning at bay (so to speak). In between bites, I thought about the other venues of this city and how we could squeeze them into our visit. I looked over at Federico who was enjoying his Pitts-Burgher cheese steak just as much as I was the HBK. “How do you think Andy Warhol would interpret the HBK?” I asked him. “He wouldn’t,” Federico replied. “He’s dead.” Federico was more concerned with finishing lunch than entertaining any thoughts of translating food into pop art. But the different flavors of the HBK sent my taste buds — and my thoughts — into overtime. The sandwich, oddly enough, left no heaviness in my stomach and made me hungry for the city itself. I looked over at the mirrored wall behind the bar with Primanti Bros. Bar and Grill sign aglow in green and pink neon lights, perched above the neatly lined rows of vodka, scotch, whiskey and other assorted liquors. I thought about ordering a bottle of Fat Head’s, one of the indigenous craft beers that I experienced the previous night, but then thought better of it. I needed to stay hydrated for all of the walking ahead of us. I shifted my glance over to Jourdan, my other sports traveler, who was also in the throes of enjoying her turkey breast and cheese sandwich. “How can we fit a quick stop at City Books into our schedule?” I asked her. “I can’t see how with everything else we have to see,” she offered. No one engaged my author invitation so I returned to the beast on my plate. The sandwich, oddly enough, left no heaviness in my stomach and made me hungry for the city itself. I finished, got up from the table, and walked over to the other side of the restaurant, which featured murals of caricatures of the many celebrities who called Pittsburgh home — from Gene Kelly to Arnold Palmer, Terry Bradshaw, and Fred Rogers, the creator and host of the PBS classic Mr. Rogers’ Neighborhood. My friends joined me and then we made our way up to the Strip, talking with sidewalk vendors and checking out their fan gear. T-Shirt prices started at $7, but I later heard it was possible to talk vendors down to $4 and even lower. One design combining all three major league team logos on a black tee caught my eye and my wallet. I savored the scents of roasting garlic, bacon, and fresh bread emanating from restaurant kitchens punctuated with tangy scents of fresh peppers, tomatoes, lemons and grapes when we passed street-side vegetable and fruit stands. I watched Jourdan dart into the Allegheny Coffee and Tea Exchange and then glanced down at the sidewalk easel with “nitro coffee” written across the top in white chalk. The idea of infusing coffee with a shot of nitrogen gas intrigued me, but then thought the better of it in view of what I just had for lunch. Maybe a little too explosive for me at this time of the day. Jourdan walked out with an iced coffee, and Federico darted over to the other side of the street, checking out the menu of an Italian restaurant. “Didn’t go for the nitro?” I asked Jourdan. “Oh, no. Not ready for that just yet,” she said. At noon, the Strip’s cafes, restaurants, and ethnic grocery stores bustled, and I savored the scents of roasting garlic, bacon, and fresh bread emanating from restaurant kitchens punctuated with tangy scents of fresh peppers, tomatoes, lemons and grapes when we passed street-side vegetable and fruit stands. I sensed a way of business and a rhythm from another time. I thought about Joe Primanti pushing his cart down here and schlepping his sandwiches to the blue-collar workers back in the early 1930s. We strolled past Roland’s Landing with patrons sitting beneath bright red patio umbrellas on the upper deck. I could have walked the full length of the street if we had more time. 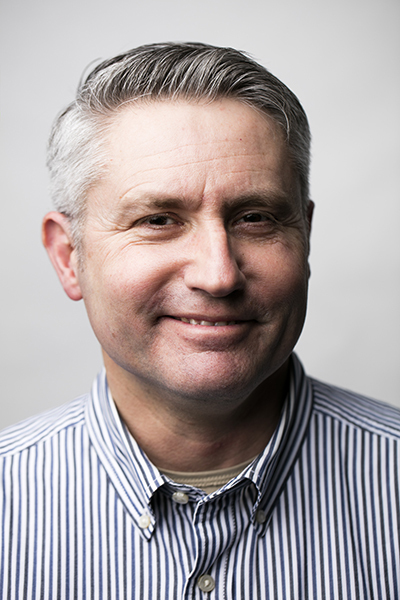 Steven Bontrager, a native of Denver now working as a director of communications for a riverfront advocacy group in Pittsburgh, likes the sense of community and the size of this city. “It’s the biggest little city in the U.S.,” he says. Just a half-mile from the Strip, we entered into the Sen. John Heinz History Center, which houses the Western Pennsylvania Sports Museum—two floors densely packed with sports history from the area. The three of us split to view the exhibits separately and then met later to compare notes. I covered everything from the 1960 World Series, the Steelers’ Super Bowl appearances, and the Stanley Cup wins, to the Indianapolis 500. I even captured the minutiae of facts like W. W. “Pudge” Heffelfinger as the first athlete to play football professionally in 1892, and Will Cross, a Pittsburgh native with Type 1 diabetes, ascending the summit of Mt. Everest in 2006. I headed downstairs and found Federico sitting alone at a table in the museum café between a 1940s Pittsburgh streetcar and a 26-foot long cannon from the Civil War. The Western Pennsylvania Sports Museum, located in the Sen. John Heinz History Center, houses exhibits like this one which immortalizes The Immaculate Reception—arguably the most famous play in the history of American football (photo credit: Federico Ghelli). By late afternoon, we reached PNC Park to purchase tickets for the Pirates-Arizona Diamondbacks game. With time on our hands, I led my cohorts in a stroll along the riverfront. Three rivers—the Allegheny, the Monongahela and the Ohio — all flow through this city, giving it strategic and economic value through the course of its existence. Facing so much water, Pittsburgh built bridges, 441 to be exact (and a number more than the Venice), and the second busiest inland port in the country to stay connected with the rest of the world. In fact, some Bucs fans arrive by water, tying up their boats to the public pier. But today, there are just pedestrians walking along the Allegheny River — mostly young people. I pass by a woman sporting raptor sunglasses and Nike running shoes, pushing a three-wheeled jogging stroller and with two children racing ahead of her. Census statistics bolster my impression that this is a young town. The median age here is 32.8, significantly below the national median of 37.7, and the millennial population has increased by about half a percentage point each for the 25-to-29 and 30-to-34 age groups in the past decade. Christopher Briem, an economist at the University of Pittsburgh, believes the area will continue to attract young people as more jobs become available in high tech, the life sciences, and energy. We stepped into McFadden’s on the west side of the stadium. Wooden booths and a sea of tables flanked the four-sided bar which boasts banks of television screens above it. A t-shirt-and-shorts crowd clustered on one side of the bar, enjoying pregame brews. We ordered a round of Iron City Light beer and a basket of wings even though that HBK continued to sustain me. I caught bits of bar conversation about Pirates’ pitching for tonight’s game. “I bet Hurdle will start with Locke and then switch to Feliz,” said one guy with closely cropped black hair. “Maybe Locke, but Melancon definitely will be the closer,” countered another guy in a white t-shirt and black shorts. How convenient that I could order another HBK at PNC Park, I thought. It would probably taste even better out here. By the time the game started, I still was not hungry. But I did notice a Primanti Bros. restaurant stand along with Quaker Steak & Lube and BRGR stands at the “Smorgasburgh” food court on the main level. How convenient that I could order another HBK at PNC Park, I thought. It would probably taste even better out here. In the row behind us, I noticed some Pirates fans noshing on cups of crab fries. I turned around to the fellow with uncombed flaxen hair and a faint trace of a moustache. “I bet they taste as good as they smell,” I remarked to him. Jake Allerd, from Altoona, said that he got them at Chickie’s and Pete’s at the Pop’s Plaza Food Court over by Section 129. Allerd works at a Sheetz convenience store back home, and tonight he is here with his co-workers and manager Shannon Flanagan – a group of 20-somethings enjoying a night away from the shop. He says he is content with just a cup of crab fries whenever he attends at a game. “It’s the cheese dip that makes these fries sell. Closest thing to heaven,” Allerd offered. Just then in the fifth inning, Pirates third baseman David Freese hit the ball high off of right-hander Rubby De La Rosa and landed it in the Pirates bullpen out behind centerfield. Sky rockets launched into the night sky, flaring out in streaks of red, as he brought two others and himself home. 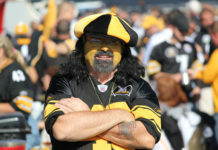 The crowd roared, and across the stadium, many began to unfurl their Jolly Roger flags from the stands in the stadium. 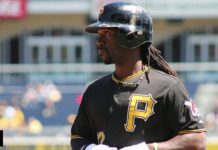 The Pirates pulled ahead, 5-4, and their determined offense held the one-run lead for the rest of the game. 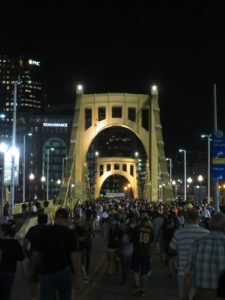 Walking across Roberto Clemente Bridge after the game (photo credit: Tim Hansen). We joined the flow of fans streaming out into the street and walked across the Roberto Clemente Bridge (the police close it off to traffic just before the start and then for an hour after the game). It’s a nice way to stretch after sitting through nine innings of baseball. The glare of the stadium lights reflected off of the Allegheny, and a tour boat, lined with a string of white lights on its sides, emerged from out of the inky darkness. I heard strains of jazz from a sax player perched atop one of the bridge’s trusses. The music briefly stops, and the perched musician blurts out one-liners to passers-by. “Hey, man. She’s too young for you!” he says to one 30-ish-looking couple. The night is warm and inviting, and I find myself yearning for something to stretch out this day. Federico took a few more pictures, and then we made our way back to the car. As the swatches of black and gold poured out into the night, my thoughts turned back to lunch all those many hours ago. I was still not hungry. What a sandwich.